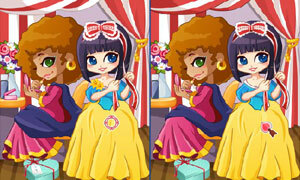 Snow White Valentine is another spot the difference game by girlsgogames. Find all the differences in each scene to watch this chocolatey spin on a classic fairytale unfold. If you get stuck, you can always click the magnifying glass for a hint. Happy Valentine's Day! Good luck and have fun.